The species of Gymnopilus I have collected are just about the most prolific spore producers to be found among the gilled mushrooms, rivaled only by the Oyster Mushrooms. You probably won't need to make a spore print in order to see the orange to orange-brown or rusty brown color of the spores, since spore dust frequently coats everything within a few inches of the mushroom. In fact, you should be careful what you touch after handling spore-coated specimens; I have a pair of jeans that still displays a nice Gymnopilus spore print, two years and many washings after wiping my spore-coated hands on my thighs. But I don't recommend using "over achieving spore producer" as an identifying feature, since my limited experience may not actually be representative for the genus. Better features to rely on include the growth on wood (for all but a few of the roughly 200 species worldwide) and the orange to orange-brown or rusty brown color of the spore print (on your jeans or on paper). Under the microscope, the spores in Gymnopilus are warty, and cheilocystidia are almost always present on the gill edges. The principal sources of identification confusion are Pholiota and species in the deadly Galerina marginata complex. Under the microscope, species of Pholiota have smooth spores, which will separate them handily. Species of Galeina have a plage on the spore, while species of Gymnopilus do not. I am not stressing here several features that are often stressed in field guides (the sometimes bitter taste of Gymnopilus species, the black reaction to KOH, and the sometimes-present partial veil) because it is dangerous for a beginner to taste mushrooms that could be confused with Galerina marginata, and Gymnopilus collections are not always bitter, even when they're "supposed" to be--and the KOH reaction and partial veil are also found in many Pholiota species. Identifying the species of Gymnopilus, in North America anyway, cannot yet be done with scientific accuracy. Researchers (Guzmán-Dávalos et al., 2003) have discovered that the features traditionally used to sort out Gymnopilus species--spore dimensions, the absence or presence of a partial veil (and its persistence, if present)--do not successfully identify genetically distinct species within the genus. So, if your goal is not scientific accuracy but stubborn determination to put a Latin name on your mushroom collection, get out your microscope and see the traditional Gymnopilus treatments by Hesler and by Guzmán-Dávalos listed below. (However, Guzmán-Dávalos is the primary author of the paper that suggests these treatments, including her own extensive keys, are not necessarily accurate--so I have to ask you: if she is bravely willing to face scientific reality, why aren't you?) The best we can do at the moment is to await further research and, in the meantime, refer to the major species groups that have been defined by previous treatments--keeping in mind the strong possibility that we will need to revise our ideas about how to separate the mushrooms. 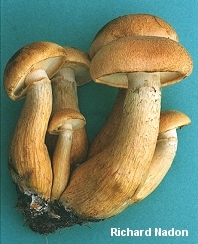 Aside from the Guzmán-Dávalos study mentioned above, published DNA research has not set its sights on Gymnopilus--though preliminary results from Moncalvo and collaborators (2002) suggest that the traditional placement of Gymnopilus within the Cortinariaceae will have to be revisited, since the saprobic genus Gymnopilus is not closely related to the mycorrhizal genus Cortinarius. Abraham, S. P. & A. R. Loeblich III (1995). Gymnopilus palmicola a lignicolous Basidiomycete, growing on the adventitious roots of the palm Sabal palmetto in Texas. Principes 39: 84-88. Guzmán-Dávalos, L. & G. Guzmán (1986). Hongos del estado de Jalisco, VII. El genero Gymnopilus (Cortinariaceae). Revista Mexicana de Micologia 2: 157-185. Guzmán-Dávalos, L. & G. Guzman (1991). Additions to the genus Gymnopilus (Agaricales, Cortinariaceae) from Mexico. Mycotaxon 41: 43-56. Guzmán-Dávalos, L. (1994). New species of Gymnopilus (Agaricales, Cortinariaceae) from Mexico. Mycotaxon 50: 333-348. Guzmán-Dávalos, L. & G. Guzman (1995). Toward a monograph of the genus Gymnopilus (Cortinariaceae) in Mexico. Documents Mycologiques 25: 197-212. Guzmán-Dávalos (1995). Further investigations on Gymnopilus (Agaricales, Cortinariaceae). A new section and a new species from Mexico. Mycotaxon 54: 117-124. Guzmán-Dávalos, L. (1996). Primer registro de Gymnopilus (Agaricales, Cortinariaceae) de Guatemala y un analisis de las especies centroamericanas y del Caribe. Revista Mexicana de Micologia 12: 89-96. Guzmán-Dávalos, L. (1996). New records of the genus Gymnopilus (Agaricales, Cortinariaceae) from Mexico. Mycotaxon 59: 61-78. Guzmán-Dávalos, L. & Ovrebo, C. L. (2001). Some species of Gymnopilus from Costa Rica and Panama. Mycologia 93: 398-404. Guzmán-Dávalos, L. et al. (2003). Traditional infrageneric classification of Gymnopilus is not supported by ribosomal DNA sequence data. Mycologia 95: 1204-1214. Available online from Mycologia: http://www.mycologia.org/cgi/content/full/95/6/1204 . Hesler, L. R. (1969). 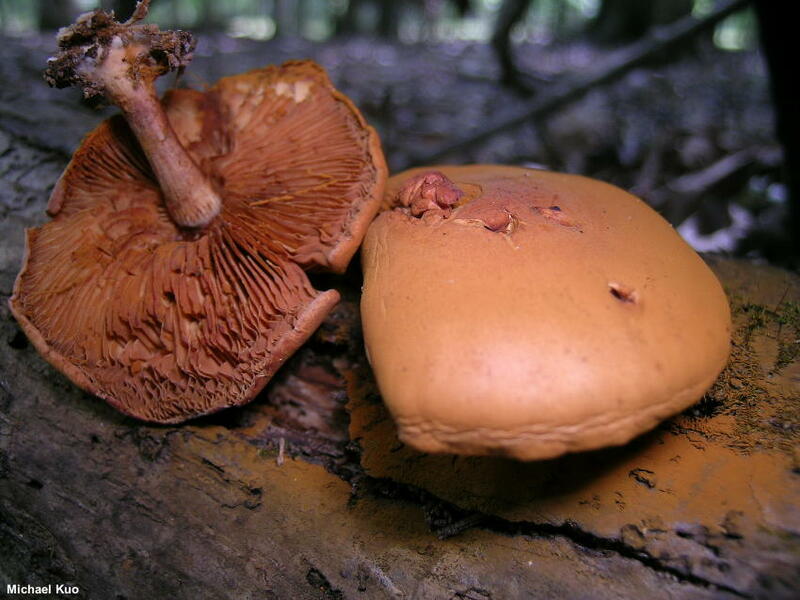 North American species of Gymnopilus. New York: Hafner. 117 pp. Høiland, K. (1990). The genus Gymnopilus in Norway. Mycotaxon 39: 257-279. Available online at Libri Fungorum: http://194.203.77.76/LibriFungorum/Image.asp?ItemID=189&ImageFileName=0257b.jpg . Moser, M. (1983). Keys to Agarics and Boleti (Polyporales, Boletales, Agaricales, Russulales). Ed. Kibby, G. Transl. Plant, S. London: Roger Phillips. 535 pp. Orton, P. D. (1993). Gymnopilus. In British Fungus Flora, Agarics and Boleti. 7 / Cortinariaceae. Eds. D. M. Henderson et al. UK: Royal Botanic Garden Edinburgh, pp. 58-72.